The Cube is revolutionizing the Karting sport. Racers can now afford a product that extends engine life, reduces qualifying times and delivers unbeatable engine response on initial starts. Priced at about the cost of a set of tires, preheating eliminates the stressful planning and timing of the harmful revving ritual. Simply install the CUBE onto the Kart, plug in the power cord, wait less than 10 minutes and your engine and radiator are up to peak operating temperature. All of our heating products are made in the USA using European Flow-thru, On-demand technology. Low mass internals and minimal stored volume rises engine and cooling system faster than any other product on the market. Our Hot Head units are also the lightest, most compact and most affordable (watt/$). Warrantey backed durability confirmed, hundreds of units dating back to 2004 are still delivering race winning advantages. 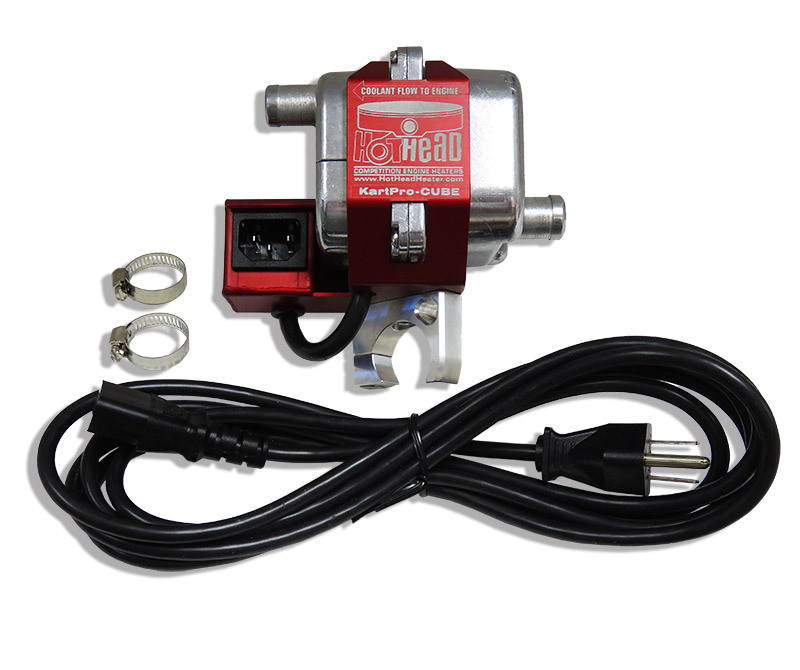 Our unmatched line-up of heating units and interfacing accessories provide options for any engine, large or small.